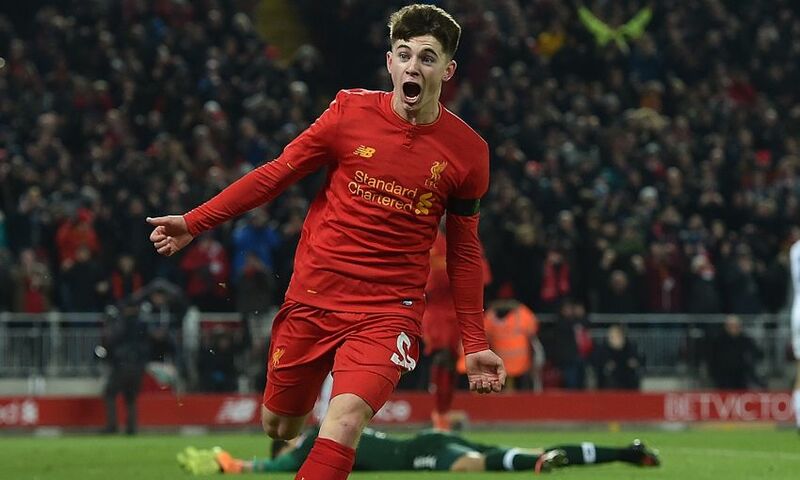 It was an 'unbelievable' moment in the fledgling career of Ben Woodburn – but one the Liverpool youngster is already putting firmly behind him. Three days on from his senior debut as a late substitute against Sunderland, the 17-year-old was brought on in an EFL Cup tie with Leeds United at Anfield as the Reds searched for a breakthrough. Soon after, fellow Academy graduate Trent Alexander-Arnold curled in a sublime cross for Divock Origi to shrug off his marker and prod a finish inside the near post. Then, four minutes later, Jürgen Klopp’s side forged another promising opportunity in front of the Kop, one which this time fell at the feet of Woodburn. A composed swing of the forward’s right boot and history was made. A new name was in the record books as Liverpool’s youngest ever goalscorer. “It was unbelievable when it happened. I didn’t even know how to celebrate, I just went mad. It was crazy,” said Woodburn in a special interview alongside Alexander-Arnold and Ovie Ejaria at Melwood which is available to watch in full below. “I just knew I was going to smash it and try to finish it off. Then it went in and I just went mad. It was a side-foot as well, but I tried to put as much power as I could on it. Luckily, it went straight in. The teenager was speaking ahead of Liverpool’s FA Cup third-round clash with Plymouth Argyle, when the trio – who have each made their first-team debut this season – will hope to feature again. During an extended conversation, the three reflected on the progress they have achieved in recent months and how the guidance received at the Academy and Melwood has underpinned their development. They are by no means the first to make the step up from the club’s youth teams, either, with the likes of Cameron Brannagan, Pedro Chirivella, Sheyi Ojo and Kevin Stewart earning opportunities under Klopp. With the willing help of those already established at senior level to offer their advice complementing the support of the dedicated backroom staff, the system is clearly working. “Playing with better players brings out the best in you,” explained Woodburn. “When you see what they can do… you’ve just got to try and do what you can do. “Obviously some of the things they do are unbelievable, and you might not be able to do that, but as long as you can show what you can do, it’ll be fine. Immediately after the Leeds game finished at Anfield, Klopp used his post-match press conference to request calm and realism with regard to media exposure around Woodburn and his talent. It was a sentiment the softly-spoken young man, who only a year-and-a-half ago was trying to earn a regular place in the U18s side, completely understood. And one he appreciated, too. “You know what you’re capable of and you know the manager has got trust in you,” said Woodburn. “He knows what’s best, so you’ve just got to follow what he wants you to do. I just tried to clear it out of my head really.